I have looked far and wide and can not find a way to convert a dual iso .mov file (the one that flashes between high and low iso) into an HDR file. I have a friend who can do it on windows by following a tutorial. Surely there must be a way to do it on Mac? literally been looking at this on and off for over 2 years now and its killing me! ha. anyone at all have an idea of how I can do this? It would be fine linking said tutorial. Have you tried using those Windows programs with WINE? HDR conversion can be done in "Switch"
With switch and MLV App methods of processing both HDR (h.264) and MLV (RAW) do we still need to effectively double the framerate whilst recording? In regards to MLVApp specifically, to process Dual-ISO. Do we need to check all the relevant boxes in the settings box ie. dual-iso, vertical lines etc. 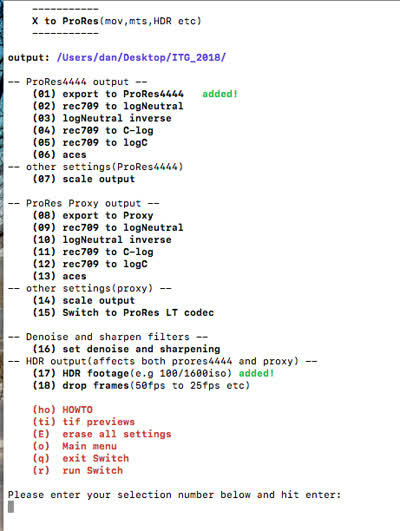 And then check the HDR-MOV_script before export? Is that the correct process? I couldn't find any explanations or documentation for MLVApp regarding Dual ISO processing requirements. dual iso is not the same as HDR. Even if you shoot with two different iso settings creating flickery footage dual iso is baking in both iso into one image. HDR is not working that way. So if you recorded HDR files meaning every other frame is another iso you can just go ahead and run the app not thinking about fps. The scripts works by processing consecutive frames creating a file with retained fps. I am testing and mainly just confused with the finer details as I am getting differing results. Totally understand HDR is for h.264 and Dual ISO is for RAW video. Maybe i'll try and change my main question. Is the purpose of HDR_MOV script in MLVApp designed for raw video shot with DualISO enabled? I guess i am confused because HDR is supposed to only be used with h.264 - therefore not needing to be processed via MLVApp. 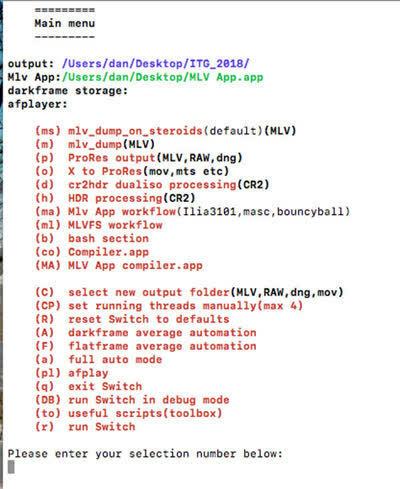 What does the HDR_MOV script do in MLVApp? Who says HDR video is only for H.264? It can be used with raw video. Upload a sample file or post something more specific of what you are trying to achieve. Can't help further before this. Still I wonder why you havn't tried my suggested workflows(or maybe you have). 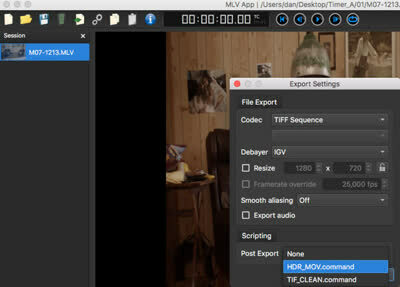 Mlv App only runs mlv files and the script is doing post processing to whatever is exported from the mlv(tiff, mov, avi, mp4 etc). The exact same script is included with Switch(bash section part). Danne, it's literally been over 2 years trying to work this out. Thank you so much for sharing all of this! Great to be able to preview the .MLV files in your app and great to be able to put out blended HDR .tiff files from your app! I haven't worked out how to then put those blended HDR .tiff files into a a .mov or .mp4 housing yet, so thats the next step. But for now, thank you so so much, really so stoked out on this!!!! Cool, did you select a prores setting as well before export?